If Trump goes to war against freedom of the press, who wins? PRESIDENT TRUMP makes no secret of his loathing for the news media. Crude and juvenile attacks on journalists — "scum," "slime," "crazy," "moron," "disgusting," "sleaze" — were a mainstay of his presidential campaign. But the media bashing has grown even more menacing during his first weeks in the White House. In a bizarre and rambling press conference on February 16, Trump lambasted the press for peddling "fake news" and trafficking in "hatred." In a tweet the next day, he labeled The New York Times and four broadcast networks "the enemy of the American people." He repeated the "enemy" language when he addressed a gathering of conservative activists in Washington a few days later. The president denounced news organizations for reflecting "their own agenda" and "not the country's agenda," and insisted that they "shouldn't be allowed" to use unnamed sources in their reporting. "The fake news doesn't tell the truth," said Trump. He warned: "We're going to do something about it." Addressing the Conservative Political Action Conference, President Trump slammed the nation's media as "the enemy of the American people," and vowed: "We're going to do something about it." His hostility continued throughout the day. Trump's press secretary barred journalists from the Los Angeles Times, Politico, the BBC, and other media companies from attending the White House daily briefing, and the president was back back on Twitter late that night, fuming about the "fake news media" and the "great danger" they pose to the country. 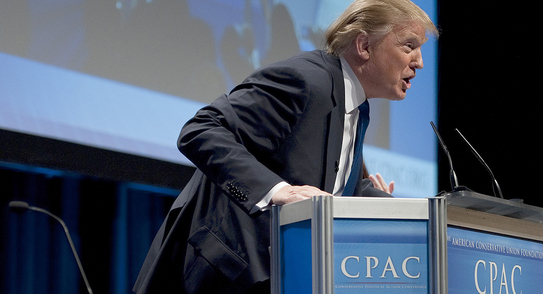 There is nothing new about presidents venting — and worse — at the press. The Obama administration harshly attacked Fox News, wiretapped thousands of Associated Press phone calls, and persecuted reporter James Risen of the New York Times to make him to break a vow of confidentiality. Richard Nixon had a secret "enemies list." In the nation's early years, John Adams's Federalists indicted editors and publishers of newspapers friendly to Thomas Jefferson. But Trump's assault on the news media is unprecedented in the modern era. No president has come to office after a long campaign in which he so routinely, angrily, and publicly savaged the press; no president has devoted such a large chunk of his first weeks in office to high-profile media-bashing; and no president in living memory has used such incendiary language — "the enemy of the people" — to characterize American journalists. In fairness, Trump's aggression so far has been restricted to rhetoric — speeches, tweets, and lashings-out at news conferences. No newspapers have been prosecuted, and no journalists have been rounded up. Apart from barring some disfavored news organizations from press briefings, what Trump calls his "running war" with the press has consisted to date of blistering and slanderous trash talk. But we are only in Week 6 of Trump's administration. If the president is this belligerent toward the media now — when no catastrophe has erupted and his White House is not embroiled in scandal — what can we expect when a genuine crisis breaks out, and Trump is enraged by media coverage he considers unfair? If the least criticism today, before anything has gone seriously wrong on his watch, can provoke him to such demagoguery, how will he react when stinging headlines reveal serious negligence, corruption, or incompetence in the White House? The modern First Amendment is very strong, and reporters count on its shelter. But the modern presidency is very strong too, and the impact of the "bully pulpit" has never been greater. Who will prevail if the commander-in-chief, clothed in the immense power of a 21st-century president, sets his mind to whittling back the protections of the First Amendment? There is no way to know before it happens. But the last time a US president pushed hard to strip the press of protections it took for granted, it didn't go well — for the press. Exactly a century ago, Woodrow Wilson, having embarked on a foreign war with Germany, embarked on a domestic crusade against dissent and criticism in the media. In a speech to Congress, Wilson famously declared that American troops abroad would "make the world safe for democracy." In the selfsame speech he warned that any "disloyalty" on the home front "will be dealt with with a firm hand of stern repression." 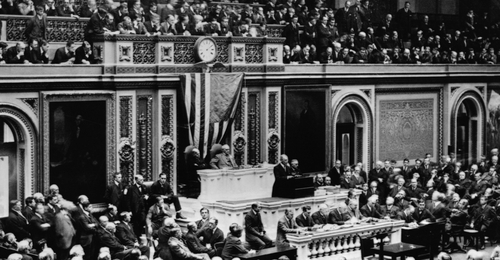 Woodrow Wilson asks Congress for a declaration of war against Germany, and announces that "disloyalty" on the home front "will be dealt with with a firm hand of stern repression." He was as good as his authoritarian word. Wilson pulled out the stops to whip up public sentiment against antiwar dissenters, especially Socialists, and against "vindictive" immigrants "who have poured the poison of disloyalty into the very arteries of our national life." He pushed for and signed the Espionage and Sedition Acts of 1917-1918, which made it a crime to "utter, print, write or publish any disloyal, profane, scurrilous, or abusive language" about the federal government. The law empowered the Postmaster General to block any publication deemed insufficiently patriotic, and dozens of periodicals were put out of business. No help came from the courts. In 1917, the publisher of a German-language Missouri newspaper was hauled into federal court for printing a series of editorials and articles opposing Wilson's war policies. Jacob Frohwerk was convicted of violating the Espionage Act and sentenced to 10 years in prison. Frohwerk appealed to the Supreme Court, pleading his right to publish under the First Amendment. The justices unanimously ruled against him, on the grounds that his writings might convince some readers. Eventually the war ended. Wilson left the White House, and the Supreme Court revived the First Amendment. No president since Wilson has launched a serious jihad against dissent and the free press. Today, the idea of an editor going to prison for merely criticizing the government seems comfortably far-fetched. Then again, until last week so did the idea of a president, just weeks into his presidency, defaming the national media as the enemy of the American people. Oprah for president — or for queen?